Did President Trump make a deal on DACA? A deal that actually involved working with Democratic Party members of Congress? Yesterday, the media said, "Yes," or at least, "we think so." Of course, nothing is done until it's done; we will all have to wait to see what ultimately happens. Nonetheless, the news stories raise an intriguing possibility. Could it be that we are finally moving away from a politics that is so hyper-partisan that it might be possible to contemplate a Congress that will play the role it is supposed to play in our governmental system? After the election of President Obama, in 2008, the Republican Party took the position that all Republican Party members of Congress would vote, en bloc, against anything that President Obama proposed. And the Party acted accordingly, with the Republican Party leadership ruthlessly enforcing that hyper-partisan "party line." That meant, as a practical matter, for the last six years of the Obama presidency, that nothing could happen on any significantly controversial matter. Any legislation passed by the Republican-controlled Congress could be vetoed by the President, and any program that the President favored would simply not be enacted by the Congress, no matter what. In the latter category was immigration reform, and specifically any program that would try to find ways to allow children who had been brought to the United States without proper authorization to stay in this country, and to continue to contribute to it. The President's "Deferred Action on Childhood Arrivals" program, carried out by Executive Order, was one of the "work arounds" that resulted from the Republican Party's unwillingness to work with a Black President. With the election of President Trump, the Republican Party assumed complete control of the Executive and Legislative branches of government. It seemed pretty clear, as well, that the appointment of Justice Gorsuch to the Supreme Court also put the Judicial branch into Republican Party control. The DACA program was an easy target. Its existence came about through an Executive Order from a Black President, and now the Republicans could get rid of it. Not unexpectedly, President Trump did, in fact, indicate that he was going to shut the program down, but he put a little spin on the pitch. Maybe, the president suggested, the Congress might want to legislate itself on this topic. As I noted in this blog on September 5th, it seemed to me that there was a hopeful aspect to the president's action. If the news reports from yesterday pan out, that hope will have proven to be not unfounded. Our governmental system, as outlined in the Constitution, is premised on the idea that the Congress, with representatives supposedly responsible not to a national party ideology, but to local voters, will propose legislation to address issues of national concern. That legislation will have to pass muster with the president, who is elected "nationally," not locally, so both "national" and "local" political opinion and perspectives will be decisive in the enactment of any law. That's the way "it spozed to be." Hyper-partisan political ideologies are not supposed to be the key factor in the governance of the nation. 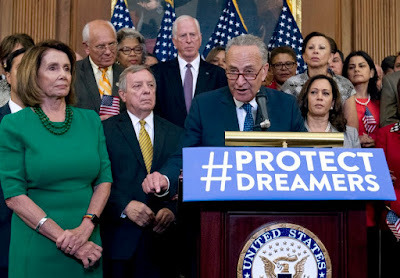 As I said in my earlier blog posting, if President Trump's actions on DACA can actually demonstrate that our political system can work in the way it is supposed to, his ability to have saved the "Dreamers" will keep the "American Dream" alive in more ways than one. If the DACA deal comes off as advertised, I think it would be fair to record the President's actions as a "good deed," and to post this fact in the "give the president some credit, where credit is due," column! Nitpicking: If only Mr. Obama had as much time as you have given him to be President; "That meant, as a practical matter, for the last ten years of the Obama presidency..."
Not a bad nit to pick, Leigh! What's four years when you're having fun? I will make a change, and thanks for that nitpick!